I recently came across an article about August Thyssen in the summer series on famous scions of the Lower Rhine region, published by the Rheinische Post newspaper, under the promising headline ‘A Globaliser From The Start’. But it contained the sentence ‘After the World War, August Thyssen lost his foreign participations’. As somebody who has studied the Thyssens for some fourteen years now, it was the kind of throw-away remark that sharply reminded me once again of the systematic manipulation of history that has accompanied this dynasty’s personal and corporate affairs for a very long time. If you wish to get a very basic idea of what I’m talking about, go to German Wikipedia and check out the entries for Alfred Krupp, Hugo Stinnes, Friedrich Flick and August Thyssen; all four legendary German industrialists of similar status and place in history. Krupp warrants 5 illustrated pages, Stinnes 11, Flick 10, but Thyssen barely manages to make three quarters of a page! Why should this be so? The chief publicist and archivist of ThyssenKrupp, Professor Manfred Rasch, is more than capable of producing lengthy features on the founder of the Thyssen empire at opportune moments in local publications, such as Westdeutsche Allgemeine Zeitung, which are hugely sympathetic to the image of a company that still remains one of the major employers in the Ruhr area, as well as far beyond. So why does he not ensure that extensive and accurate information is available on a more general level? The answer is: because there are many black holes in this dynasty’s history which would be too difficult to broach. Instead, gloss-overs and simplifications have been produced over the years by the official guardians of the Thyssen legacy and reproduced by unwitting journalists and historians. But even the most consistently spin-doctored histories are eventually bound to come unravelled. This is particularly true in times of bust such as today, when money becomes scarce and people re-examine their loyalties; as long, of course, as they can enjoy the freedom of democracy rather than being forced into the shackles of authoritarian rule so admired by the likes of Ecclestone, Mosley & Co.
One reason why the Thyssens have always purported to have ‘lost everything’ in the war (for the family members tend to ‘go the extra mile’, insisting all was lost, not just the foreign assets) is to excuse their involvement in arming the German Empires of Kaiser Wilhelm II and Adolf Hitler respectively. If it were shown that they actually profited from those regimes, the Thyssens would receive far less sympathy and respect than they do when portrayed as the sacrificial victims of the conflicts, who had to rebuild their fortunes each time from scratch by the sweat of their own brows. The latter being very much the picture painted on the new website of the Thyssen-Bornemisza Museum. In actual fact, while other industrialists were punished for their support of the Reich, the Thyssens were not. They were even compensated for their losses. After World War I, this included their Lorraine ore mines and steel works, which the French insisted they give up. Heini Thyssen himself admitted to David and myself that far from his family losing, for instance, his grand-father’s Brazilian interests after 1918, he was able to liquidate some of them in the 1970s at vast profit. Despite such good fortune, ‘foreign assets’ have always been a particularly contentious issue in the Thyssen historiography, not least because this most quintessential of German dynasties, whose name still remains one of those inextricably linked with the fatherland’s deepest sense of national prosperity, honour and pride, has continuously reaped the benefits of German industry, while simultaneously refusing to admit allegiance to the country. While the destruction of August Thyssen’s personal files after his death in 1926 ensured the public could never realise that this supposed German patriot had in fact moved his ultimate ownership structures abroad before 1914, a more overt public relations exercise was necessary after 1945 when the magnitude of the Nazis’ criminal activity came to light. That is why official communiques began to over-engineer Heinrich Thyssen’s cosmopolitan credentials, giving assurances that he ‘had distanced himself from Germany as a young man’, that he ‘became a Hungarian in 1906’, that he ‘gained a doctorate in philosophy in London’ and that he ‘settled in Switzerland in 1932’. On closer inspection even of the official sites, however, inconsistencies soon start to appear for all of these claims. As far as Heinrich’s nationality is concerned, ThyssenKrupp AG has for some time now resorted to the line: ‘He kept his Hungarian citizenship until he died, but nevertheless acted ‘deutsch-nationally’ at times in the 1920s and 1930s. For this vague statement to be allowed to paraphrase the activities of such an important (if shielded) figure of 20th century history is quite simply astonishing. And of course it can in no way explain how German works owned by Heinrich Thyssen were still able to claim war damages from the allied government for Germany in 1946 on the basis of Heinrich being ‘a German abroad’. The fact is: Heinrich Thyssen lived in Lugano from 1938 (not 1932! – more of this later) until his death in 1947, controlling his German interests with the help of visiting managers and this makes him somebody who acted ‘deutsch-nationally’ (if this is what you want to call it), throughout Hitler’s time in power and beyond. Turning to Heinrich’s academic title: the assertion of a doctorate in philosophy gained in London is pure fabrication. That is why it does not appear on the German websites, where it is clear and very acceptable to people that the doctorate was gained in Germany in the field of natural sciences. It is, on the other hand, very much emphasised in Spain, where the government’s expenditure of in excess of $600 million dollars on the Thyssen-Bornemisza art collection seems to make it imperative to stress the founder’s alleged cultural and specifically non-German credentials. The smoke and mirrors at Museo Thyssen continue: ‘It is through the correspondence between August Thyssen and Auguste Rodin, namely in a letter from 1911, that we can see that August’s son Heinrich had by that time started his collection’. We have researched the same letters during the writing of our book but never came across anything that would confirm this. The official line basically intimates that with his transformation into a ‘Hungarian aristocrat’ in 1905 (the real dated being 1906-07), Heinrich Thyssen had also, somehow, acquired an art collection. What seems clear to me is that people in charge of that museum are finally realising that they have a particularly grave problem on their hands. However, not knowing what to do about it, their inability to address serious issues breeds insecurity and confusion. That’s why another sentence has been added to the website: ‘We have few details about the first years of the collection’. While I guess it would be unfairly over-stressing the point if one reminded the Spanish tax payer once again, how much money he contributed and is still paying to the Thyssen Museum, the indelible facts concerning the early history of the collection are these: the Thyssen Collection was never at Rohoncz (Rechnitz). It was only named ‘Rohoncz Collection’ by Heinrich Thyssen with the specific aim of making it sound like an Austro-Hungarian heirloom. Unbelievably, the public as well as the media have bought this fiction decade after decade. The staff of Frankfurter Allgemeine Zeitung got equally confused in October 2007, when they ran David’s piece on Heinrich Thyssen’s daughter, Margit Batthyany, and her involvement in the murder of 180 Hungarian Jews at Rechnitz Castle in March 1945, which had been published two weeks earlier in The Independent. None of the many continental journalists and historians who subsequently busied themselves in denigrating our work, such as Anja Seeliger of Perlentaucher fame for instance, actually figured out that the reason why the two features were markedly different was not only because of overt censorship in Germany, but also because staff at FAZ saw fit to fact-check the article – the fruit of 14 years of research – against the grossly inaccurate (ThyssenKrupp AG / Museo Thyssen / Thyssen Family) Gospel According to Wikipedia, the same Wikipedia that has rejected our corrective suggestions outright. Back at Frankfurter Allgemeine: out came 1938 as Heinrich’s settlement date in Switzerland, in went 1932 (to ensure that Heinrich’s presence in Germany after Hitler’s ascension to power could be denied). Out went the proviso that the collection was never at Rohoncz, in went the age-old phrase that it was housed there. Out came our statement that the Thyssens acquired the Erlenhof stud farm from the liquidators of the persecuted Jew, Moritz James Oppenheimer, in 1933. In went the fabrication that Heinrich Thyssen’s business empire was completely separate from August or Fritz Thyssen’s empire. While we are grateful to FAZ for publishing the feature, this type of inaccurate ‘editing’ of copy in a newspaper of such quality should be of concern to everyone. And even today, two years after the publication of our book, the Spanish museum continues to insist that ‘Heinrich Thyssen’s enterprises were completely separate from the German steel industry’, when even ThyssenKrupp’s website has been admitting for a while now that Heinrich owned the Press- and Rolling Works Reisholz and the Oberbilker Steelworks, both plants that produced canon for Adolf. Spain is also still holding on to the idea that Heinrich was ensconced in Switzerland from 1932 onwards, where he ‘opened the doors of his gallery to the public in 1936’. Apart from family archival evidence, Heinrich’s own war-time curator, butler and companion, Sandor Berkes, assured us that the gallery building remained unfinished until 1940 and was only opened to the public in 1948. 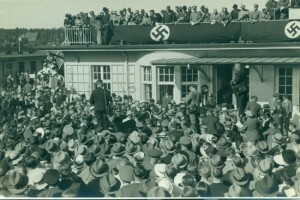 As can be seen from the picture above, far from being locked away in his Swiss villa, in 1936 Heinrich was, amongst other things, happily socialising at the German Derby with his personal friend Hermann Göring, whom he also assisted with personal and Reich banking facilities. I can understand that the various guardians of the Thyssen legacy would feel the need to rewrite the unacceptable history of this family. But I do not appreciate the fact that journalists, historians and those who should know better continue to encourage the belief in facts which they know to be untrue or should admit to be so since the publication of our book. As far as the Spanish public in particular is concerned, which is at this very moment being told by Guillermo Solana, the director of the Thyssen-Bornemisza Museum, that new gallery space is urgently needed in Malaga and Sant Feliu de Guixols because the Madrid museum is ‘running out of space’, I feel the time has come to tell him that before any more tax funds are poured into Thyssen projects, the Thyssens might be more truthful about their past and that of the collection, while the Spanish government must admit how much they have and are paying the Thyssens for the display and storage of their paintings.